That just about sums me up. Not the kind of power that politicians, bishops and emperors run on; the kind of power that takes one from point A to any other point on the globe in a real hurry. I wish an F18 pilot would invite me along for a ride instead of some reporter or news anchor who wouldn’t know an airplane or raw power if it bit him or her on the elbow. I would like to yank a jet off the runway, perhaps not this close to the ground as you can see in the picture hereby, but perhaps a couple of inches higher, just to be sure I won’t be kissing the runway with those expensive pair of cheeks of the F18. 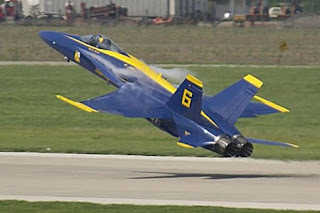 Air force pilots can afford to rotate so close to the ground because, in the first instance, it’s not their airplane, and secondly, they have practiced riding a rocket out of the cockpit. I haven’t and it’s not my jet. If it were my jet, I’d have to fork over some serious cash just to write my name on the title, let alone keeping it there. But, as my brother always used to say, if you are going to dream, dream of worthwhile stuff not affordable ones. That’s a waste of time. Ideally, I’d like to have a machine in which I can pull the nose up into a vertical climb and watch the ground fall away until it becomes a smooth surface, the horizon exhibits proof that the flat-earth theory is false, and the blue of the sky is beneath me. For some reason, I wouldn’t want to experience that without the roar of the power that comes with that experience. I’d have to first think about doing that as an angel or spirit or other than having a massive jet engine strapped to my posterior. Perhaps that would have a kick of its own, I don’t know. Right now, kerosene, plenty of it per minute, and an engine that knows what to do with it, seems to be the ultimate thrill. Without that, it would seem like a Jurassic movie with mime-dinosaurs. It won’t fly, but we’ll have to wait and see, right? Back into my realm of expectations, I relate the F18-imagined experience to a turbo-charged VW Passat that I had a couple of years ago. The turbo-rush of that 1.8 liter, four cylinder engine made me call it my little rocket ship. It’s a good thing I cannot afford a turbo Porsche or something really potent. I’d bend the steering wheel from all the trying to pull it up into a vertical climb.